Will I ever have more than 100 Botox Patients per month? There’s a nifty feature in Allergan’s Brilliant Distinctions program which allows one to track data – such as how many patients have seen you for Botox within a certain period of time. I decided to look at these numbers monthly. So far, I’ve been able to extract data starting with January 2011. Numbers before that don’t exist because we weren’t busy users of Allergan’s Brilliant Distinctions at the time. We are currently happy users of Allergan’s Brilliant Distinctions program with about 850 different patients enrolled in the program. 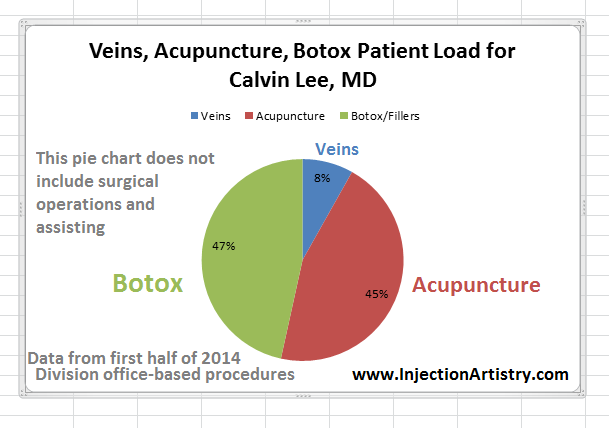 Visit this link for Statistics of our Modesto Brilliant Distinctions: Botox, Latisse, Juvederm. Well, this hasn’t happened yet. I got close in June, 2014. I reached 97 Botox patients for this one month. However, I continue to improve. I also know that quality trumps quantity most times. However, I also do know that experience matters and is based on repetition and seeing many different situations. For the month of July 2014, I saw 95 patients. Still not quite at 100 Botox patients yet per month. Visit my Modesto Botox homepage for more updates. Vacations, work in Los Angeles, Acupuncuture activies, and operating days are factors which take away from this Botox Statistic. Another update, in October 2014, I saw over 120 patients that month. So, getting over the 100 patients per month? – done!